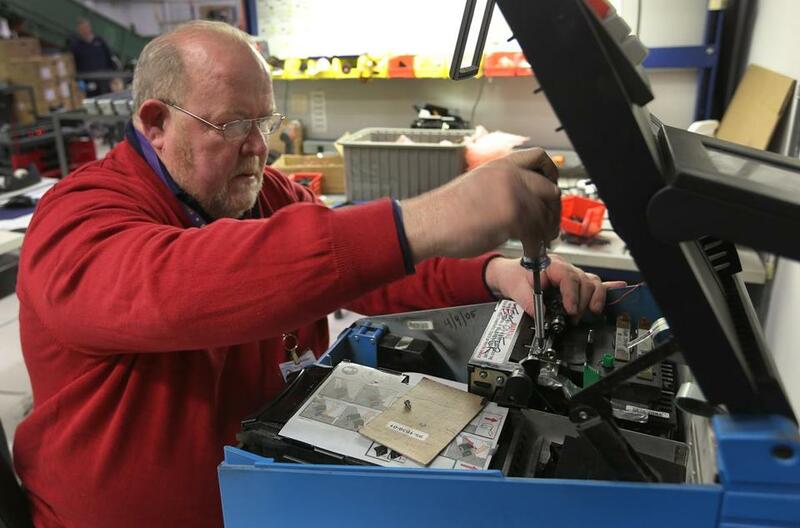 Lottery employee Mike Kelly worked on a machine at MassLottery headquarters, where workers cannibalize broken lottery terminals for parts to repair other terminals. 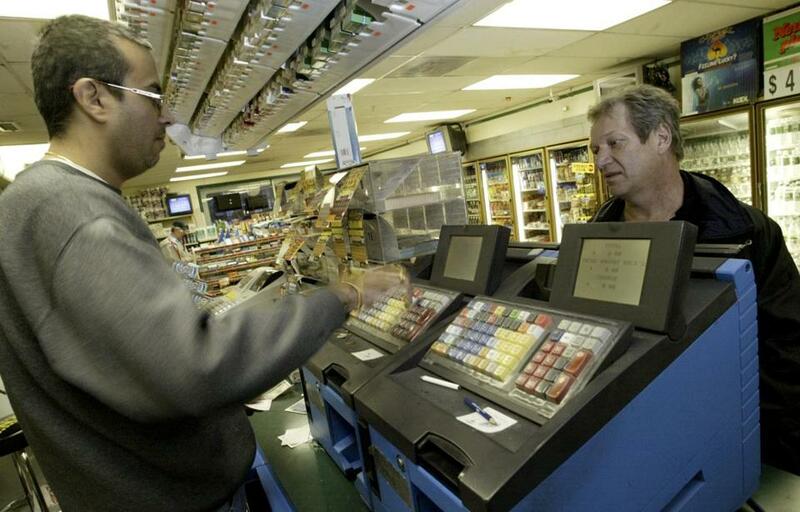 For 18 years, an unremarkable blue machine has been a fixture at corner convenience stores, its tired keys accepting millions of bets from players hoping a lucky string of numbers — a kid’s birthday, an old address — will just this once bend the rules of probability and change everything. But, with casino gambling coming to Massachusetts, the state lottery is looking to replace the 8,500 aging blue terminals and the massive computer system that processes nearly $5 billion in bets a year. Lottery officials hope the sophisticated technology in newer terminals will help them hang onto loyal customers tempted by glitzy slot machines and table games. The machines are called the GTech ISYS, the ubiquitous but woefully obsolete lottery terminal that is finally set to be retired after dutifully spooling out 79 miles of tickets and receipts since 1997. Graphic: Who wins in the lottery? The terminals have not hampered sales at one of the nation’s most successful lotteries. Massachusetts residents spent $736 per capita on lottery games last year, far more than residents in any other state, according to La Fleur’s Magazine, a trade journal. In 2014 the lottery distributed $974 million in local aid to towns and cities. But the stash of spare parts is running critically low. More important, the advent of casino gambling in Massachusetts has presented the lottery with direct competition for the first time. Newly elected Treasurer Deborah Goldberg, whose office oversees the lottery, said she is determined to preserve lottery profits and local aid — and believes new terminals will be a vital tool in that effort. The lottery is soliciting bids for new terminals that will be easier to reprogram remotely, so it can quickly push out new games and promotions. Modern computers will also allow officials to better monitor how different games are selling in different areas — spotting, for example, a drop-off in sales near a new casino. And the lottery wants to introduce a loyalty card system for frequent players, something that is impossible on the current terminals. New terminals may even allow players to submit their lucky numbers using a smartphone application. The technology for such mobile gambling already exists and is popular in Europe. Here in Massachusetts, the app could only be used inside a store with a lottery terminal, as state law prohibits gambling from home. Rich suspects mobile gambling could one day make the countertop lottery terminal itself obsolete. That, however, means lotteries will have to design systems that, for example, verify users’ ages or set spending limits to control addictive gambling. When casino gambling was introduced in Iowa in 1991, lottery profits dipped by about 12 percent, then tumbled again in 1996 and 1997 after slots at racetracks were legalized. Each time, Rich said, the Iowa lottery clawed back within several years, which he attributes in part to new products and additional marketing. The lottery is also soliciting a second contract to replace the computer systems that power the network of blue terminals and run the betting operations. Officials hope the costs of both jobs will come in under $65.5 million and expect bids from the industry’s three largest companies: GTech S.p.A., an Italian company with its US headquarters in Rhode Island; Las Vegas-based Scientific Games; and Greek firm Intra-lot SA. Gtech and Scientific Games declined to comment, citing the open bid process; Intralot did not respond to a request for comment. Old as they are, the Gtech terminals inspire some affection. Harish Chopra, owner of VIP Convenience in Cambridge, said nearly 50 percent of his revenue comes from lottery sales processed through the machine. He can work the keys almost without looking, his fingers guided by a decade of muscle memory. Still, Chopra understands why the state wants to replace it. On recent drives to Connecticut and New Hampshire, he couldn’t help noticing how newer terminals in those states use thermal printing instead of the ancient dot matrix technology in the ISYS terminal. “It’s like everyone else got iPhones and we still have flip phones,” Chopra said. What to do with the old ISYS terminals when they are replaced? Chopra has a suggestion. The old blue lottery machines have been around since the 1990s.